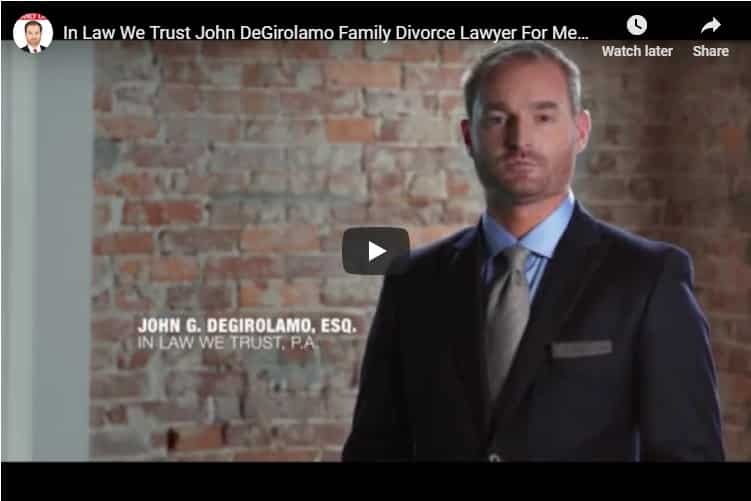 Tampa Alimoney Attorney For Men - Spousal Support For Husband Tampa | In Law We Trust, P.A. Nobody goes into marriage expecting to file for divorce, but the statistics show that as many as 50 percent of Americans eventually will. Known as a “Dissolution of Marriage,” all Florida divorce procedures are similar. However, the particulars of every case are different, so it is important to have knowledgeable family law attorneys from In Law We Trust, P.A. when navigating the process. Florida uses principles of equitable distribution to determine assets and liabilities in a divorce. In general, each spouse shares 50 percent of the property, even if one spouse did not work outside the home. The court may award the custodial parent with ownership of the home and this may affect the distribution of assets even when both parties are still legally responsible for the mortgage. A Judge has significant leeway when determining alimony awards and can require anything from short-term payments to permanent payments from the primary breadwinner in the marriage. It is common, however, to award durational alimony to match the length of the marriage. A divorce in Florida begins when one spouse files a Petition For Dissolution of Marriage and states that the marriage is “irretrievably broken” or there are “irreconcilable differences.” To complete the request, one spouse must show at least six months of Florida residency, but there aren’t any requirements to prove infidelity or abuse to file in the state Florida. The initial petition includes “wants” and “needs” that the filing spouse has for things such as property, alimony, child custody and child support. After the Petition for Dissolution of Marriage is filed by an attorney in the record, the other party must be officially served and allowed sufficient time to answer. A sheriff or other court-approved server of process will deliver the petition to the opposing spouse, who has 20 days to respond. If the spouse is unavailable, an experienced divorce lawyer can be successful at finding alternative means to serve the spouse you wish to divorce. The firm, In Law We Trust, P.A. knows the due diligence necessary to locate the person and has the expertise and resources to find them. We specialize in representing husbands and fathers, so if you are facing divorce, and want to obtain the best legal counsel, call us immediately. One of the biggest factors in a smooth divorce is the level of cooperation between the spouses. A Florida divorce can be either contested or uncontested. In an uncontested divorce, each person agrees to the settlement terms and everything is negotiated beforehand. Once the divorce attorney files all the paperwork with the court, it can be resolved in as little as four to five weeks. A contested divorce means that the two parties cannot agree and therefore, the court will determine the final settlements. This process takes much longer. Depending on the local court jurisdiction, it can be six months to a year before the case even reaches a Judge. In Law We Trust, P.A. works extremely hard to obtain the soonest court dates and force opposing counsels to meet terms so as to speed up the process. We are also known for our expertise in obtaining spousal support for husbands, in Tampa, FL so give consideration as to whether this may be a prospect you hadn’t even thought of. Some people attempt to represent themselves in a divorce, but it is not advisable. The average layperson does not have a full grasp on the laws pertaining to Florida divorce and will not be able to assess their rights and responsibilities adequately. Each of the parties should have separate representation to avoid a conflict of interest. The court will appoint an attorney in cases of financial hardship, and it is possible that the defending spouse could be ordered to pay attorney fees and costs. Know your rights! In Law We Trust, P.A. will ensure that you, as our client, have a strong case with proper advocacy. If there is violence in a relationship, especially if children are involved, it is critical to obtain legal counsel as soon as possible. To protect the at-risk partner, the attorneys of In Law We Trust, P.A. may advise you to seek a restraining order. A temporary restraining order can mitigate immediate risk and provide safety to you and your children. Once a Judge hears the case, which is usually within days, a permanent order can be issued that will bar the violent partner from entering the family home or even from being in the vicinity of the protected spouse or children. There does not need to be a Petition for Dissolution of Marriage in place to file a restraining order. Depending on the situation, it is not always the woman in the relationship who is awarded spousal support. Stay-at-home fathers or men who have put their careers or education on hold to care for the family could also be awarded either child support, alimony, or both. The law firm, In Law We Trust, P.A. represents men and husbands seeking spousal support or child support, in Tampa, FL. We also represent men opposing spousal support or unreasonable child support. Again, each divorce is unique and you may have legal rights for spousal support for husbands that you had not even considered.